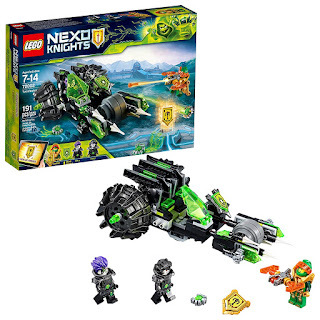 Right now you can get this LEGO NEXO KNIGHTS Twinfector for ONLY $12.99 (Retail $19.99)! Help Aaron fend off evil twins Fred and Pola in their powerful 2-in-1 LEGO NEXO KNIGHTS 72002 Twinfector vehicle with dual critter shooters. Divide the Twinfector to launch the 2 individual flyers and double the LEGO NEXO KNIGHTS battle fun. This cool toy for kids includes 3 minifigures and 2 scannable shields.